Ontario's long-awaited election day is finally almost upon us. There is a unanimous view that the Liberals are finally going to be thrown out, bag and baggage, after four catastrophic terms, when the province was mortgaged to hare-brained alarm about climatology and electricity-generating facilities were shut down and solar energy and other nostrums subsidized as the province piled up bone-crushing deficits and manufacturers were effectively encouraged to pack up their cards and leave. Over 300,000 manufacturing jobs were lost in southwestern Ontario as electricity costs skyrocketed for all Ontario residents. Only the ineptitude of successive Progressive Conservative campaigns and a formidable Liberal display of electoral skullduggery and chicanery, some of it master-minded by Obama tactician David Axelrod, has kept the regime in office until now. One of the province's former premiers, when I encountered him socially a couple of weeks ago, declined to predict the outcome but said "I know a tsunami when I see one." In the past 10 days, there has been a surge of conventional wisdom that the NDP has gathered strength and could emerge as the largest party, which would mean that it could govern, but with the support of the Liberals. If this were to occur, the outgoing premier, Kathleen Wynne, would perform a feat worthy of Mackenzie King, the all-time champion of Liberal trumpery and duplicity (an astonishing 22 years as prime minister between 1921 and 1948), in sustaining a heavy rejection but retaining the balance of power in the legislature, upon which the victors would be dependent. 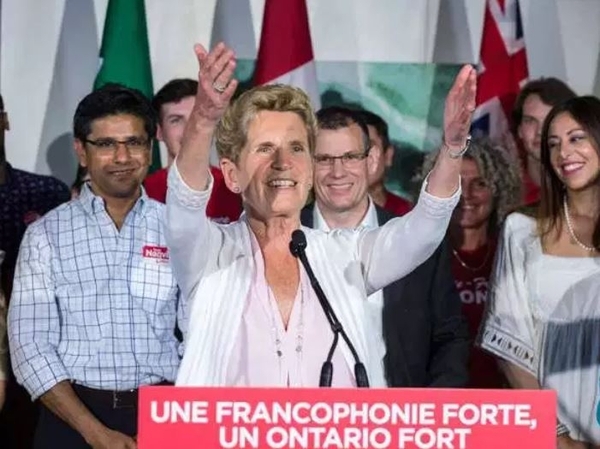 It must be said that Premier Wynne has fought a brave campaign; she did not yield to the temptation to step aside and leave someone else to take the bullet, as did Pierre Trudeau and Brian Mulroney (who were followed by John Turner and Kim Campbell, respectively) and others have done. She has fought her corner with dignity in very unfavourable circumstances. Policy shortcomings do not deprive her of her right to personal civility and respect. It is a striking contrast between leaders. Wynne is politically unpopular with reason. The leader of the opposition, Doug Ford, is the authentic leader of Ford Nation, a powerful populist force in the Greater Toronto Area, and is a good and purposeful man, but is widely regarded as bumptious, under-qualified, and for better or worse depending on perspective, something of a reactionary. The NDP leader, Andrea Horwath, is almost unknown across the province. That she has the handicap and also the advantage of relative anonymity despite being a veteran politician may be taken as indicating that she is no world-beater by any relevant criterion. In theory, the large number of people who dislike Wynne and Ford should go by default to Horwath, and there is some recent general opinion that this will happen, boosted by some dubious robo-polls. Even serious polls show the race tightening between the NDP and Conservatives. Ontario has been terribly misgoverned these 15 years, and a negative economic miracle and a depleted treasury have resulted. Unemployment is relatively low, but a good deal of that is with people patching jobs together, or making do with less well-paid jobs than they had before, or a rickety combination of part-time work with self-employment. The positive aspect of the unemployment rate is undermined by the diminished share of the population in the work force, and by a reduction of many incomes. Ontario is not full, as organized labour falsely claimed in the United States in the Reagan era, of hamburger flippers, pants pressers and pizza deliverers (all very necessary occupations), but the income-earning quality and comparative prosperity of the workforce have declined. It is ironic and nonsensical that those who have failed to deliver progress or advocate the policies that could generate progress militantly demand to be styled as "progressive." Ontario is a jurisdiction of serious discontent, seeking a radical, not a superficial, change. Such a commendable ambition would not be served by handing the government of Canada's largest province to the same party that is making such a horrible mess of Alberta and British Columbia, and whose only previous stab at government in Ontario was such a shambles that the leader, Bob Rae (a very affable and capable man), after being disemployed as premier, decamped to the Liberal party, where he served with distinction in Ottawa. The NDP is never an improvement on the Liberals and Horwath's latest brainwave is the unutterable fatuity of proclaiming Ontario to be a "sanctuary province." This is an imitation of the pathetic detritus of the Trump Resistance: let everyone in, let them vote whether they are citizens or not, and don't let the census-takers even put the question of citizenship. (Trump will crucify his enemies but Canada is a long way from Mexico and Horwath will not pay as fully as she should for this outbreak of pseudo-altruistic insipidity). I do not believe the NDP will surge into the lead; rather, I think this is one of those elections where the people indulge themselves by trying on the imprudent, and are reawakened when the polls frighten them back to their senses. Some of this was present in the past federal election when the NDP's Thomas Mulcair edged into the lead in the polls, and the country thought better of it. Winston Churchill, who was not a particularly successful party leader (he won just one of three elections in that role), said, "Trust the people." Even if we had a choice, that is what we must do now. Doug Ford represents frugal but compassionate government, concern for the people but refusal to make a socialist hammock-pitch for their votes. He is not a precise and overly articulate champion of detailed policy, but he can be relied on to do the right and the sensible thing. That cannot be said of his opponents. He has the good qualities but not the bad qualities of his late brother (Toronto mayor Rob Ford). His Ontario would attract investment, roll back political correctness, fulfill his pledge to cut taxes, relaunch the country's largest provincial economy, and with it, much of the country. He will have a strong team, led by Christine Elliott, Caroline Mulroney and Rod Phillips. In this triad of leaders there is no messianic candidate, but there is a clear choice. Kathleen Wynne cannot be re-elected, nor Andrea Horwath put into her place unless Canada's greatest province has lost all sense of self-preservation. It hasn't, and the choice is clear: Doug Ford must be elected premier, and he will be. It won't be Camelot or the philosopher king, but it won't be a continuation of bad government or daily replays of the less dignified aspects of the Ford mayoralty either. This time, the office seeks the man: Doug Ford is the candidate of returning prosperity and fiscal responsibility.